There have been several changes in the amplifier world since we last took a look at this mega amp article, spurring us to refresh a lot of content. We have replaced some models in our top ten chart, such as the Bugera Trirec and the Vox AV15, with a host of new additions. These include classic combos like the Fender Champion 100 and the Vox AC15C2, with some awesome heads such as the EVH 5150III and the Boss Katana, as well as the super portable Roland Cube Street. An electric guitar without an amplifier is pretty much a silent acoustic guitar – not much use to anybody. Ultimately, if you play the electric guitar, a good amp is as important as the instrument itself. Whether you are buying your first or fifth amp, you have come to the right place. In addition to our top ten chart on this page – highlighting some of the best guitars on the market in all price ranges – we have broken things down into individual categories to help you find exactly what you need. Plus, we have written a short guide to give you some of the key information that you need to know when buying a new amp. Let’s get stuck in! One of the most legendary amps for the fans of heavier tone. A legendary tone monster designed by Eddie Van Halen. All the tone of a 6505 with less of the power. A modern reimagining of the iconic AC15. Huge power and tone for a surprisingly low price. Affordable Marshall combo sets the standard for practice amps. Plenty of versatility from this cost-effective combo. A classic Fender combo amp with great power. Huge tone and power from this high-end acoustic amp. A solid dual-channel choice for street performers. The 6505 from Peavey is a legendary all-tube amp head in the world of metal and the 6505 Plus takes that awesomeness to another level, which is why it sits at the top of this chart. It’s a popular choice for stage performers around the world thanks to its reliability, consistency and a huge 120 watts of power, driven by six 12AX7 preamp tubes and four 6L6GC power amp tubes. It’s a versatile head with two customizable channels for quick switching between lead and rhythm playing. Tonally, it’s very flexible but is excellent for hard rock and metal as the gain on offer is very intense. You can read more about this amp in the full review of the Peavey 6505 Plus. Another iconic amp head to grace our top ten chart is the EVH 5150III – the 50-watt version, which we have reviewed in full here. As the name and grill décor suggests, this all-tube head is designed in association with Eddie Van Halen and built by Fender, and delivers a sensational tone fit for the legendary virtuoso, from pristine cleans to face-melting distortion. The 50-watt version is driven by seven 12AX7 preamp tubes with two 6L6s powering the amp, which is surprisingly huge in output – capable of filling an auditorium no problem (depending on your cab, of course). Other features that make this such a popular choice among gigging guitarists include three customizable channels and a four-button footswitch. While the 6505 Plus we feature above is one of the most legendary amps around, not every guitarist needs that kind of power. Enter, the Peavey ValveKing II, which takes the reliability and tone of the original 6505 and squishes it into a smaller package. This compact all-tube head features a maximum of 20 watts of power (switchable to both 5 watt and 1 watt for quieter operation), which is driven by a pair of EL84 power tubes and three 12AX7/ECC83 preamp tubes. This awesome little amp also includes two footswitchable channels, a set of solid and flexible controls, USB output for easy recording and MSDI Output with XLR. Check out the complete 6505 MH Micro review for all the details. Inspired by the original 1960’s Vox AC15, the modern AC15C2 all-tube combo amp combines the retro design and fluid vintage tones you’d find on the original AC15 along with a surprisingly good price tag. With a trio of 12AX7 preamp tubes and two EL84 pentode power tubes, the AC15C2 offers a maximum output of 15 watts, delivered by two 12” Celestion G12M Greenback speakers. This all combines for an awesomely rich, chimey tone with plenty of gain and response, which will please guitarists of all styles, especially if you lean towards the vintage. Controls are flexible, while the inclusion of built-in tremolo is a bonus. There’s more on this excellent amplifier in the full review of the Vox AC15C2. 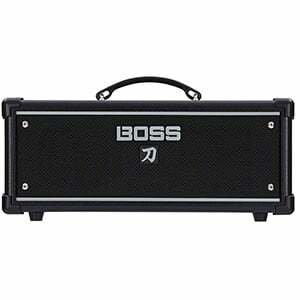 With the Katana 100-watt amp head, Boss manage to cram a lot of power into a compact, lightweight and very portable package. Hooked up to the right cab, this amp head is capable of filling even the biggest spaces with a pro-grade tone, which is hugely customizable and features five unique amp voices including Clean, Lead and even Acoustic. There’s also 15 solid onboard effects (with the ability to use three at once), as well as a convenient 5” monitor speaker for practice without a cabinet. As we mention in the complete Boss Katana review, for under $500, this is a very smart choice for the regularly gigging guitarist on a budget. As far as practice amps go, there aren’t many better than Marshall’s MG15CFX, which also comes in at a very wallet-friendly price. This compact combo is a solid-state amp offering 15 watts of power delivered via a single 8” speaker, making it the perfect companion for home use. It’s also a solid experimenter’s amp with four different customizable channels – clean, crunch and two separate overdrives – as well as a selection of built-in effects including chorus, flange and phaser. As we highlight in the full breakdown of the MG15CFX, other key features include speaker-emulated line output for great recording tone and a headphone jack for quiet practice. The ID:Core 10 V2 is another excellent solid-state practice amp that shows you don’t need to compromise on quality to save a few bucks. At under $100, this affordable combo provides both beginners and experienced guitarists with a powerful tool for home use. In addition to 10 watts of power delivered through two 3” speakers, this amp provides six different amp voicings featuring Clean Warm, Clean Bright, Crunch and two overdrives, as well as a host of stereo effects including chorus, phase, delay and echo. For such a small amp, the tones on offer are very good indeed. Be sure to check out the full review of this cool combo for all the details. Just when you think this chart couldn’t throw up another legend, the famous Fender Champion 100 shows its face! And it’s an instantly recognizable face, being one of the most popular solid-state combo amps in the world. The Champion 100 – as the name suggests – features a huge 100 watts of power, delivered by two 12” Fender Special Design speakers, which is more than suitable for most performances. As we highlight in the full review of the Champion 100, the controls are extensive but straightforward, and offer several amp voicings and effects for a flexible tone suitable for everyone from vintage blues enthusiasts to metalheads. For under five hundred bucks, it shows great value. The only acoustic amp in this chart is a stunning little combo, the AER Compact 60. With a sophisticated design and a solid birch ply build, the third iteration of this popular amp offers up 60 watts of power, which is more than enough for small to medium-sized gigs and proves very portable. As we highlight in the full review of the AER Compact 60, the control layout is simple but proves extensive in sound-shaping capabilities, with decent EQ controls for both channels (one features an XLR input for a mic). The output is delightfully warm and clear, although the final tone delivered will rely on your guitar having a good acoustic pickup. A great purchase for the serious acoustic performer. As the name blatantly states, the Cube Street is Roland’s battery-powered offering to the regular street performer as well as a solid choice for home players (yes, it comes with an adapter for playing off the mains). Even though it offers just 5 watts of power delivered via two high-performance 6.5” neodymium speakers, there’s plenty of punch for small performance and a good tone suitable for most styles of playing. This is enhanced by eight different COSM amp models and six onboard digital effects. Most useful for guitarists who accompany their playing with vocals are the two separately controllable channels, featuring both XRL and 1/4” microphone inputs. Want more on the Roland Street Cube? Check out the full review! This budget price range is home to compact, low-powered combo amps, which are mainly designed for beginners and home practice. Despite their low volume and limited features, you can find some exceptional sounds and versatility that will make practice sessions good fun. 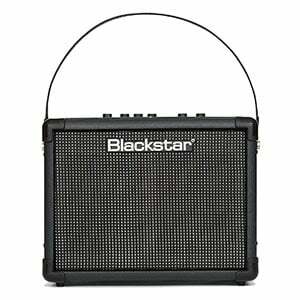 This category can throw up some poorly made cheap amps, so stick to bigger brand names, such as the Blackstar ID:Core 10 V2, which is a great example of what a $100 guitar amp should offer, including low power, decent tone, good EQ and a variety of amp voices. While you may outgrow one of these affordable amps after a year or so, they are a great way to begin. If you can afford to start on an amp in the sub-$200 segment, you will see an instant upgrade in the amount of power as well as additional features. In this category you are looking at very good practice rigs, although as power is still pretty low they may not be suitable for more than small casual performances. This is the first category where you will find both amp heads and tube amps, although the choice of these is very, very limited. One of the best amps you can grab for under $200 is the Marshall Code 25W. This combo provides a solid tone, 25 watts of power and plenty of amp voices and effects to play around with. For guitarists looking to gig, this is the best category to start shopping in because stepping into the sub-$300 range offers some great diversity as well as real stage-worthy power. As well as improved solid-state combos, amp heads and tube amps become more readily available in this range, even if they are a little basic. Some very powerful modeling amps are available too, such as the Line 6 Spider V 60, which packs a stage-worthy 60 watts of power, with more than 200 amps, cabs and effects models built in. With $500 in your pocket, buying a good amp becomes a lot easier. In fact, it’s probably as expensive as most casual guitarists would ever need to go. This category includes a big choice of both amp heads and combos, solid-state and tube amps. While they make great practice amps, they are all worthy of small to medium-sized gigs and studio recording. For example, you can find the excellent Peavey ValveKing II. This little amp head offers the same beastly tone as the iconic full-size 6505, with 20 watts of power and solid controls. Welcome to the world of premium! While there are several tiers of boutique amplifier priced higher than $1000, this category is when you really start to hit the high end. Some of the most iconic guitar amps sit in this section, although all models are capable of performing on big stages and professional recording studios with pro-grade features, exceptional tones and massive power, extending into 100 watts and above. 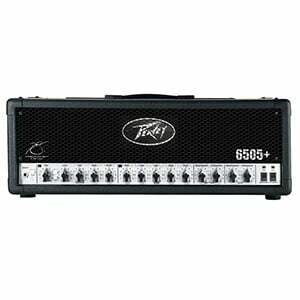 One amp you will find in this market is the legendary Peavey 6505 Plus head, which has helped shape the sound of metal over the past few decades. As nobody wants to lug around a 50-watt combo when casually travelling, many guitarists rely on portable amplifiers to quench their amp needs while on the road, street corner or beach. Power isn’t particularly important in this category – size and weight are the most crucial aspects. Other factors such as being battery-powered and having a headphone jack are also key features of these amps. 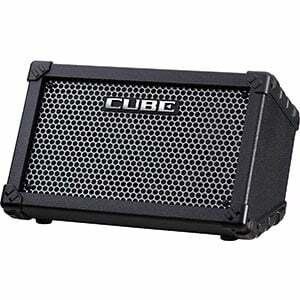 One of the most impressive is the Roland Cube Street, which is a street performer’s dream as it offers great portability, a decent 5-watt output, two channels and several on-board effects. You didn’t think we would forget bass amps, did you? Due to their inherent differences in design, bass guitars require a dedicated amplifier – using your old Fender Champion isn’t going to cut it. Bass amps offer more power, with some outputs reaching 1000 watts or more. Like guitar amps, bass amplifiers come in many shapes and sizes – including heads and combos – although the mid-range Hartke HD500 offers a stage-worthy 500 watts of power in a portable combo unit, with great controls and an excellent balanced tone. While you can play one through an electric guitar amp, an acoustic guitar will sound its best if it is played through a dedicated acoustic amplifier. While similar in structure to electric guitar amps, acoustic amps are primarily designed to offer transparency. In other words, it strives to reproduce the tone of your acoustic guitar’s natural sound as closely as possible. Interestingly, they almost exclusively come in a combo format, while most acoustic amps will have two channels – one for the instrument and the other geared towards microphone use. The AER Compact 60 represents what a great acoustic guitar amp looks and sounds like, with enough power for stage use as well as a high-end organic tone. While it is possible to practice on a huge stack, it’s more convenient (and probably more sensible) to practice on a compact, low-powered, versatile practice amp. These little combo amps are one of the most important tools in a guitarist’s tool box, especially for beginners who should avoid ‘dry practice’ (i.e. without an amp) as it encourages bad habits. Many amps can be considered a practice amp, but one of our favorites is the Fender Frontman 10G – a very affordable practice amp that offers 10 watts of power, solid Fender tone and a headphone jack for quiet practice sessions. Tube amplifiers are the original amplifier and still seen as the best way to amplify an electric guitar – and for good reason! Despite impressive advances in amplification technology, nothing beats the natural sound of a vacuum tube that has been pushed to its very limit. In fact, for many guitarists it’s either tube or nothing, as the volume, vibe and fluid sound profile of these amps is extremely hard to replicate. One model we really like is the Hughes & Kettner TubeMeister TM18H, which has killer looks, delivers a delightful tube tone, has switchable wattages, and doesn’t break the bank. Whereas tube amps are the traditional, solid-state amplifiers represent the modern guitar amplifier (even though they have been around for decades). While some guitarists refuse to consider solid-state amps worthy of their time, models such as the Roland JC-120 Jazz Chorus are proof that solid-state amplification is not only capable, but preferable in some cases. This high-end amp offers 120 watts of power, professional-grade tone and awesome versatility. It’s a good reflection of this segment, which offers endless versatility with affordable prices, low maintenance and incredible reliability. Combo amplifiers are the most popular type of guitar amplification these days. While amp heads are the source of incredible power, it is the versatility, convenience and simplicity of combos that makes them the go-to choice for so many – from beginner to seasoned pro. Combos come in a variety of flavors in all price ranges. While the practice amp and budget markets are awash with combos, there are also some epic premium models such as the Fender ’65 Princeton Reverb, which is a revamp of one of the most epic tube combo amps ever made. . While anything with decent gain could be used for metal, a dedicated metal amp is the only thing a dedicated metalhead would want to use. These amps are actually very similar to other styles of amp, with one big difference – they are loaded with massive gain, which is essential for metal. 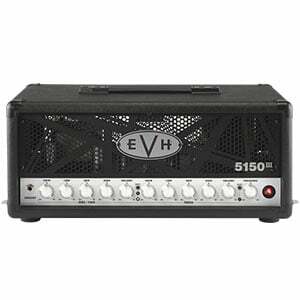 A perfect example of what makes a great metal amp is the EVH 5150III. Designed with Eddie Van Halen, this all-tube amp head is an absolute beast in term of power and gain, with face-melting distortion and 50 watts of power. Perhaps jazz amps can best be described as ‘the complete opposite of metal amps’! When it comes to finding the perfect amplifier, the main thing jazz guitarists are looking for is a clear, flat and smooth tone – the cleaner the better. Both clinically-clean solid-state amps and warmer tube amps can work well, although the latter must have good headroom to prevent early breakup and overdrive. This is why we always recommend overpowered amps such as the Roland JC-120 for jazz, as this legendary solid-state combo offers pristine cleans with a huge 120 watts of headroom. Blues is such a difficult genre to explain – and blues amps are just as difficult to define! However, there are some qualities that all blues amps should have, such as a warm and natural overdrive to deliver the grit and bite that makes blues such an emotive style. You can play blues on both tube and solid-state amps, although tube amps certainly capture the dynamics of the individual player better, which usually translates to a more soulful sound. One of the higher-end tube amps we recommend on our blues amp page is the Fender ’65 Princeton Reverb – small and soulful! New to the world of guitar amplifiers? Or a seasoned pro looking for your next stage partner? Whatever your level, there are some important things you should definitely know before you make the plunge and buy a new amp. Let’s take a look at the kind of things you will encounter. Whether you read articles about amps or talk to experts, you will definitely come across these two fundamental amplifier terms. Both describe a type of amplifier and knowing the difference between a head and a combo, as well as their pros and cons, can help you narrow down your options quite considerably. A combo amplifier is a unit in which both the amp and speaker is integrated. You plug a guitar into one of these, turn it on and you are ready to play. The obvious benefit of a combo is that you have everything you need in one standalone unit, while the sound tends to be optimized by the manufacturer to be the best it can be – there’s no worrying about matching it with a good speaker. Combo amps also tend to be cheaper than heads and, as such, are excellent for beginners. While some are very capable of small to medium-sized performance, the drawback is that combos are limited in power compared to a head. They also tend to be much heavier, which can be a pain when regularly transporting it. An amp head is an amplifier without the speakers. This is the type of amp that is most often used on stages of all sizes, from small clubs to huge stadiums. The reason is that amp heads tend to offer more power and can be hooked up to several different speaker cabinets. This allows you unrivalled power as well as the freedom to mix and match your favorite heads and speakers. Another plus is that they are much easier to carry around to gigs, especially if the venue has its own cabinet. The disadvantages of heads are that they are generally more expensive than a combo, while you will also have to factor in the cost of a speaker when purchasing one. Guitar amplifiers have seen a major evolution in the past century or so and guitarists are now left with a choice between tube and solid-state amps, as well as modelling and hybrid amplifiers. While there is plenty of information to get to grips with, knowing the basic differences between the various builds will help you make your decision. Tube amps – or valve amps as they tend to be known across the pond – are the oldest type of guitar amp design. These use vacuum tubes to amplify the signal of your guitar. Back in the day, a tube amp would have been your only option – and it wasn’t a bad option to have! The main benefit with tube amps is the tone. They offer what is often described as a pure, natural, creamy or fluid guitar tone, which is incredibly responsive to the player’s dynamics. When pushed hard enough, they overload and produce natural overdrive (which is how overdrive first came to be). While their tone is hard to beat for all styles of music, tube amps tend to be expensive, harder to maintain and heavier than other amps. For more on tube amps, check out our dedicated tube amp page. While tube amps were the only real option for decades, when the silicon chip was created some manufacturers began developing solid-state amplifiers, which used more efficient silicon-based transistors instead of tubes to boost the signal. While some tube players will never admit it, there are several benefits to owning a solid-state amp. Firstly, they are cheaper than their tube counterparts, which is why most beginners will end up starting on a solid-state amp. They are also much more efficient, easier to maintain (no need to change tubes), lighter to carry, and less fragile. While the tone of modern-day solid-state amps can be incredible, they don’t tend to be as fluid or responsive as tube amps. For more on solid-state amps, check out our dedicated solid-state amp page. Want to switch from pristine cleans, to vintage crunch, to face-melting distortion within seconds? You’ll probably want a modeling amplifier. Based on digital sound processing, modeling amps will combine many (sometimes hundreds) of iconic, vintage and modern amp sounds into a single unit, easily selectable at the twist of a dial or press of a button. Of course, the downside to modeling amps can be their recognizable digital tone, but when this means you have a whole guitar store worth of amps at your disposal it doesn’t tend to put many guitarists off. Hybrid amps are a strange beast. As the name suggests, they combine multiple technologies to produce a unique hybrid amp experience. They may use the digital front end of a modeling amp with a tube-based power stage, or a tube preamp with a solid-state power amp. The benefits of this style of lesser-seen amp is that you can sometimes get the best of both worlds, with the awesome tone of a tube amp, but with the processing power of a solid-state amp. These amps tend to be cheaper than tube amps and generally easier to maintain. In terms of power, the higher the wattage, the more volume the amp can offer. Combo amps tend to be available in anything from 5 watts to 100 watts, while heads can go much higher again. For beginners looking to practice their first notes, chords and songs, nothing more than a couple of watts is needed – in fact, most dedicated practice amps won’t offer much more than 10 watts. If you are planning on jamming with a full band or starting to gig in small venues (think bars, clubs and small halls), then anything from 15 to 50 watts will suffice. Bigger gigs, including auditoriums and outdoor festivals, will demand upwards of 100 watts. When it comes to combo amps, the speakers included will usually give you a good idea of what to expect in terms of power and performance. While bass amps are in a category of their own, guitar combos tend to use speakers of anywhere between 3″ right up to 15″. Obviously, the bigger the speaker, the better suited it is for the stage, while having more than one is an instant upgrade to the power available. A rule of thumb is to go with the most power your budget will allow. Sure, if you are a complete beginner, you don’t need 50 watts, but if you do have aspirations of performing to crowds, there’s no harm in buying something more powerful then growing into it. During your search for a good guitar amp, you may run into some terminology used to describe amplifiers, some of which may seem a bit strange. Let’s go over some of the most common terms you might come across. Quite simply, a stack is an amp head plugged into a speaker cabinet. Just think of a stadium gig – the amps used to power that epic sound are stacks. You can have either full stacks (a head connected to two speaker cabs, used for big performances) and half stacks (a head connected to a single speaker cab). Every amp will have a preamp and a power amp. These are often referred to as the preamp stage and power stage. The preamp picks up the signal from the guitar and boosts it so other parts of the preamp can manipulate it (this is where EQ and gain kick in). The power amp then takes that modified signal and boosts it to a level where the speakers can push it out. You will run into these terms most often with tube amps, as different tubes are installed in each of these stages. An equalizer (more often called EQ) is the device that allows you to adjust certain frequencies within your tone. The 3-band part implies that the EQ offers three points of control: bass, middle and treble. While 3-band is the standard, you can also have 2-Band EQ (which tend to offer just bass and treble), as well as 4-band EQ, 5-band EQ (low-bass, mid-bass, midrange, upper-midrange, treble) and upwards! Of course, the higher the band, the more versatility the amp offers. But 3-band tends to be the easiest to get to grips with. From loopers to distortion, effects pedals are a major part of guitar playing these days – and there are two ways to feed these pedals to the amp. You can run them from the front through the instrument input, or you can use an FX loop. The benefit of the latter is that it allows you to insert effects between the preamp and power stage. It’s a complicated topic that relies on a lot of trial and error – not to mention personal taste – but plugging boosters (overdrive, distortion, wah) into the front and then using an FX loop for modulators (chorus, flanger, delay) tends to deliver the best results. Buying a new guitar amp is easy. But, as you will have seen, ending up with the right amplifier for you isn’t as straightforward. Amps are not something you buy every day, so take your time, read our guide, use our categories and charts as inspiration, and ultimately you will find something that will suit you and your playing perfectly. Good luck in your hunt for the perfect amp! I think you’re getting analog and digital mixed up here and there. I may be wrong, but I thought the solid-state stuff uses digital technology, and tubes are analog. You are right, we will have the whole guitar amplifiers section of out website completely revamped in the next few weeks! We made vast content improvements on all other sections of GuitarFella and now it is time to work on the amps. Thanks a lot for the remark and make sure you check us out in 2-3 weeks, I guarantee you that you will like the results! Solid state circuits are also analogue .The key difference is that the tubes have been replaced by transistors. Digital refers to the processing and manipulation of information AFTER it has been turned into 0’s and 1’s just like in your computer. The article is written clearly enough , no need to change it . What happened to Peavey? I’ve always used their equipment and I think it’s the best sound for the money. I use various amps. I use a Hughes & Kettner Switchblade and a Matrix combo. Which are almost the same amp, but one is valve and the other SS. I used the Matrix at a gig through a 4×12 and it was fine. The only problem with ss ams is they don’t project the sound like a valve amp. Also, the valve purists often use a ss pedal to get their sound. What about the LazyJ 80 ? Where is it rated in the best of the best? I for one am skeptical, the Boss Katana 100 1×12 at $300 sounds fantastic for metal and rock, with 50-some Boss pedals built-in, but weak wrt clean tones. 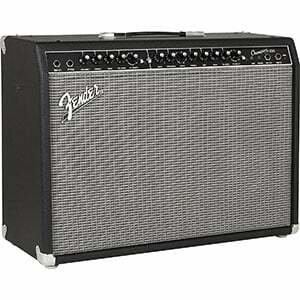 For clean tones how about the Fender Blues Jr 15w tube amp at $600 retail, and a pedal for crunchy and distorted tones. I have a question you might be able to help me with. I currently have a Yamaha silent guitar both nylon and steel and want to set up a home speaker system for a small room. I use a couple of pedals with my guitar. (reverb & delay) and at present use a Yamaha THR amp for sound. This is great for practice but does not fill the room so to speak. I have a larger acoustic amp but not happy with the sound. Can I use a pair of studio monitor speakers instead and if so would I need anything else e.g. (EQ or amp)I am looking to recreate the best possible sound I can get. At present it is only through my headphones. Any help or advice with this would be greatly appreciated. I have a hard time with Peavey being No. 1, as I’ve owned some in the past – they smoked and caught fire. Also, most of the amps on this list are solid state. No thanks!